With a slightly smaller overall head than the G15 -- and considerably smaller than most others in the category, save Titleist -- the i15 3-wood can best be described as "sleek." Though the head is a bit shallower than normal, the face is actually longer, providing a slightly larger hitting area. If a big, oversized head on your 3-wood is what gives you the most confidence, steer clear of this club. However, if you like your 3-wood compact, stylish, and with a no-nonsense, get-the-job-done look, then this might be just the one for you. With its smaller head design, the Ping i15 gives the golfer the ability to work the ball left and right, or up and down pretty easily. Ping has added an internal weighting system to create "Tour Trajectory" -- usually defined as a low, boring/penetrating ball flight. Available in both Left and Right hand orientation, the 3-wood comes in a "strong" version (RH only) with 14 degrees of loft or standard with 15.5 degrees. Shaft options include Ping's own TFC700F (designed specifically for fairway clubs) or the UST Mamiya AXIVCore Tour Red 79. The latter is a slightly lighter weight shaft at 78 grams. Either of these shafts are good choices; the TFC700F is weightier (for higher swing speeds) but again, the lower your handicap, the more you should lean toward the UST, which will tend to produce a lower ball flight. Flex options cover the usual choices of Regular, Stiff and X-Stiff, and the standard grip is the new ID8. In keeping with its overall sleek design, the Ping i15 3-wood is a dark charcoal across the head with simple red/black paint fill on the satin-chrome underside. 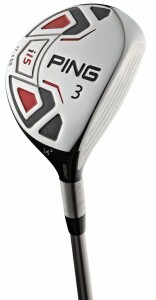 Other options to consider for 3-woods include the Titleist 910Fd and Cleveland Launcher FL model.